Bring a friend with you and experience the deeper meaning of Easter. This year we’re adding a third Sunday morning service in Issaquah and will have two services in Seattle. Plus, we will again have Good Friday services at both campuses! Easter is one of the easiest times to invite someone to church – start now and help make this a special weekend! Make plans to join us this Easter for great music, a powerful message of new life through Christ, and the personal story of faith from Brock Huard, ESPN Radio Broadcaster and former UW Husky & Seahawk quarterback. Invite someone to join you and experience the love, hope and freedom of Easter. Our Easter celebration begins on Saturday then continues with five services on Sunday at our two campuses. Children’s ministry is available for birth through 5th grade. SHARE OR TWEET ABOUT EASTER USING THE ICONS BELOW! 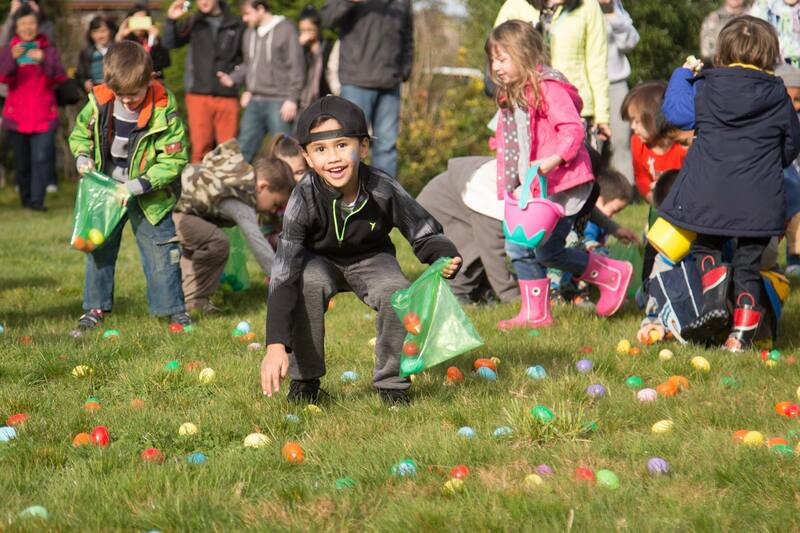 Your kids will love our annual Easter Egg Hunt with 100,000 eggs! There will be fun activities like inflatables, face painting, games, prizes, candy, and a GIGANTIC egg hunt for kids through 5th grade. (Total eggs in Issaquah and West Seattle.) Best of all, it’s free! Skip the line in Issaquah and register now using the FastPass! Find directions and information about our Issaquah Campus. Find directions and information about our West Seattle Campus.